Poineers in the industry, Intek Instruments offers an extensive range of Linear Scale / LVDT Transducer / Linear Potentiometer / Linear Transducer / Displacement Transducer. 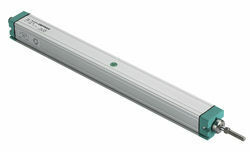 We offer Linear Scales of different Brands, such as, GEFRAN, NOVOTECHNIK, OPKON, MINOR, BALLUFF, MYAN, WAYCON. Delhi, Andhra Pradesh, Arunachal Pradesh, Assam, Bihar, Chattisgarh, Goa, Gujarat, Haryana, Himachal Pradesh, jammu and Kashmir, Jharkhand, Karnataka, Kerala, Madhya Pradesh, Maharashtra, Manipur, Meghalaya, Mizoram, Nagaland, Odisha, Punjab, Rajasthan, Sikkim, Tamil Nadu, Telangana, Tripura, Uttar Pradesh, Uttarakhand, West Bengal. We are a North Indian Distributor, Dealer, Trader, Supplier and Importer of Gefran linear scale. We are Distributor, Trader, Dealer, Supplier and Importer in North India for Gefran Linear Scale PKM Sliding Type.